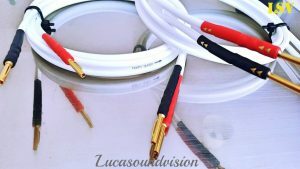 Home / Speaker Cables / FURUTECH FS-301 Audio Speaker Cable 2x 3m A Pair Terminated. 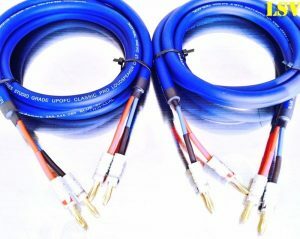 A stereo pairs ( 2x 3m ) FURUTECH FS-301 Terminated Audio Speaker Cables. The cables are high double pressure crimped of profesional crimping tool AIRLOC HIGH PERFORMANCE TERMINATION (for maximum contact surface area), To a Very high quality 24 gold-plated 4mm2 (Universal fit) Banana Z-TYPE plugs with extra Airloc crimped 24 gold-plated pin section sleeves of both ends. All ends finished with branded high quality colour coded black & red (gold arrows printed) heat shrinks sleeves. 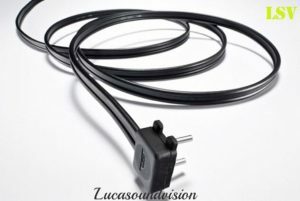 The FS-301 is a good quality OFC cable perfect for an A/V installation with its thick PVC sheath, or for anyone looking for a lower-cost run in a 2-channel setup looking for that next step up from a generic wire. If you would like a different combination of spade to spade connectors, or banana plugs to spade connectors, or different cable lengths, please ask. Please have a look at our other items, Any questions please contact with me.Thanks for looking.